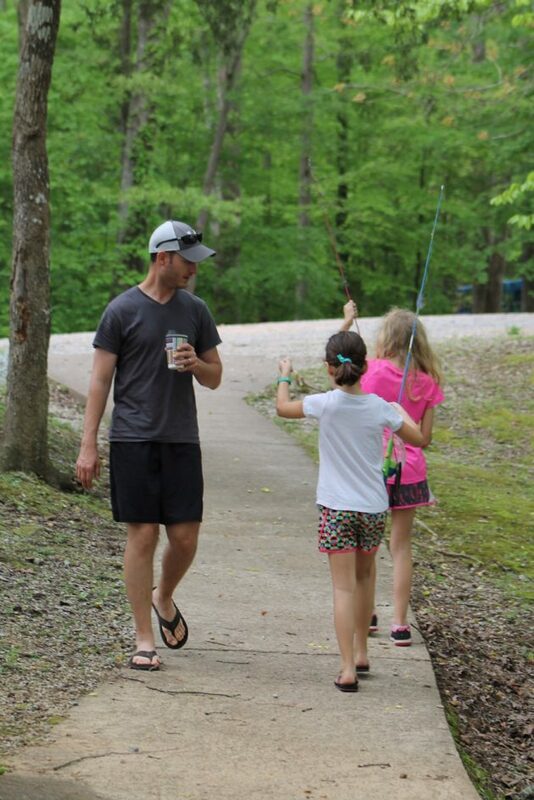 On Wednesday, I told you about How We Planned and Prepared for Our First Family Camping Trip and then yesterday, I shared about 5 Important Lessons We Learned on Our First Camping Trip. 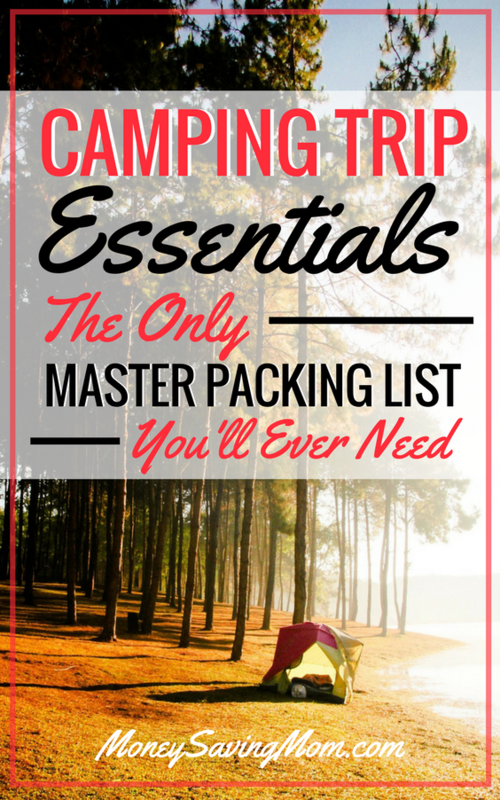 I promised you all that I would share my Master Camping List today. 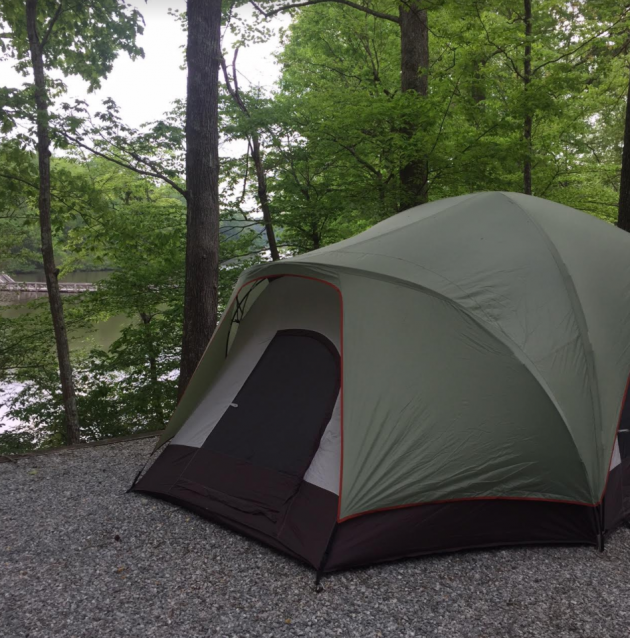 This list of things to take on a camping trip is one I compiled based upon many of your suggestions, based upon other things I read on the internet, based upon talking to other people who had been camping, and based upon what the experienced campers in our group recommended. Borrow — There are probably a lot of people you know who have camping supplies in their garage or shed or attic or basement. Ask around to see what your friends and relatives own and see if you can borrow it for your camping trip. Rent — Some stores will rent camping supplies out. 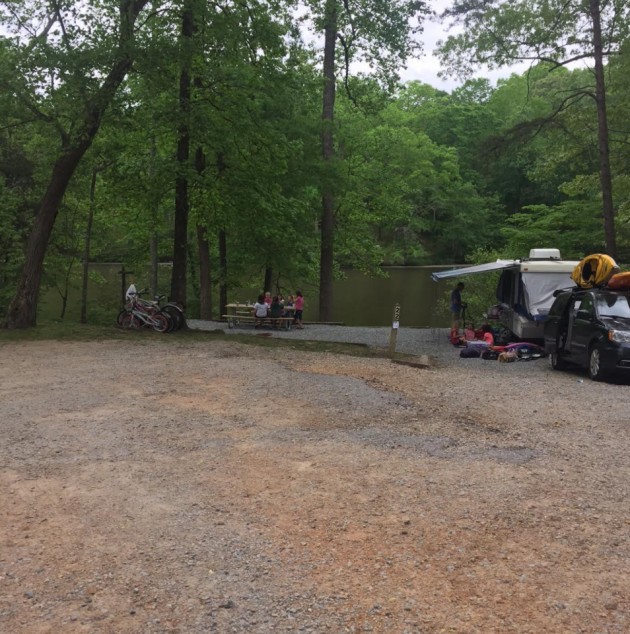 This isn’t the best option — especially if you are planning to camp regularly — but if you are planning to just try camping one time to see if you think it’s a great option for your family, renting might be the way to go. Buy Used — Look on Craigslist, at garage sales, on Facebook Yard Sale Groups, or ask around to see if anyone has camping supplies they are selling. Tent — Make sure it’s large enough for everyone to comfortably sleep in. We set ours up ahead of time to make sure that it would comfortably fit us all and to make sure we knew how to set it up quickly. A Tarp — To use underneath your tent, to use to cover things up if it rains, etc. Sleeping Bags/Pillows/Air Mattresses/Sheets — Or whatever bedding you are bringing. I highly recommend the air mattress idea if you are not really big on “roughing it”. Blankets — Bring ones that you can get dirty or don’t mind getting wet or bugs. Flashlights — One for everyone in your camping party. I also highly recommend headlamps instead of flashlights. Toiletries — Shampoo/conditioner/body wash, deodorant, etc. Toilet paper — In case the shower house doesn’t have any or runs out. Hand Sanitizer & Pump Soap — Just in case the shower house doesn’t have hand soap like ours didn’t have. Sanitizing Wipes — We used these a LOT. Bring a big tub of them! Extra Batteries — For flashlights or any other battery-powered items you are bringing. Towels — For the shower house, for swimming, etc. Cooler and ice — Consider freezing water bottles or other liquid in bottles (milk, etc.) that you are planning to bring and using that instead of ice. It’s less messy and more space efficient. Food/Snacks — Make sure to bring a lot of food. You will be hungry! Flip Flops — For the shower house. You do not want to be showering with bare feet. Ick! 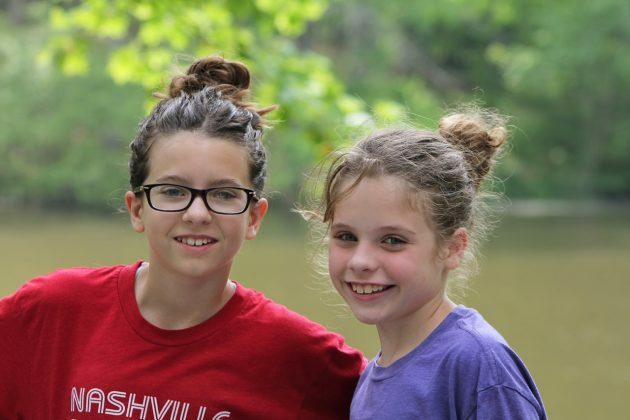 Clothes/Swimsuits — Make sure you bring clothes for both warm and cold weather. The temperature might change quite a bit. Lanterns or String Lights — It will be very dark at night. In addition to flashlights, it’s really nice to have at least a lantern or two. Ponchos/Raincoat — In case it rains. Sunscreen/Bug Spray — We were especially concerned about ticks, so we coated ourselves in bug spray. Hats — Especially if you’ll be going when it’s hot and sunny. Extension Cord — If your campsite has electricity. Water Bottles or Other Water Set-Up — You’ll be very thirsty! 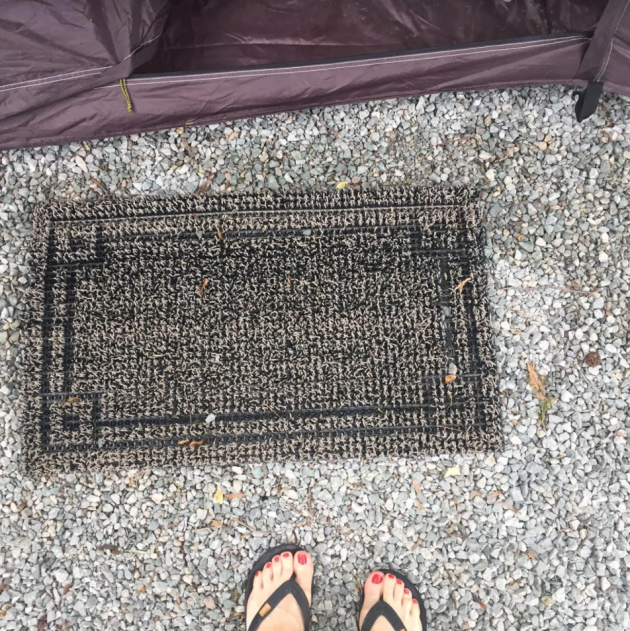 Rug for Outside the Tent — To help with tracking in less dirt into the tent. Small Handheld Broom — To sweep out the tent. Let me know what I forgot on this list! I’m still working on finalizing my master list so I’d love to hear what you think I should add to it. I’m glad you all had a good time camping. Since I insist on air conditioning and fresh sheets, our camping is limited to a Holiday Inn. Seriously, I am in awe of people who camp but it just isn’t for me. Ha! I’m in completely agreement with you! The rug for outside the tent is really important. We also put rugs down in our tent. I also do not like being in the dark at night, so I bring LED candles. They are much softer than a lantern. We also bring a pop up laundry hamper for dirty clothes. I feel a little silly having rugs, a hamper, and candles in my tent sometimes, but it really makes it feel comfy. Pop up hampers make clean up in the tent so much easier for kids! I love ours and it makes it easier when we get home to just take that basket straight to the laundry room. I LOVE having a pop up hamper for dirty laundry (in the car on the way there, I usually fill it with extra blankets). It’s easier for the kids to keep clean and dirty stuff separate and it’s easier at the end of the trip to just take that one basket to the laundry room. Girl scout trick: it may sound odd, but put the tarp down INSIDE the tent. That way, rain and wetness can not get in between the tarp and the bottom of the tent. I have one as well and it comes in handy for long hikes with girls also. Love it! I agree with games and a tablecloth. You may want to bring a folding table too. A Coleman stove is a must since cooking on an open fire is time consuming and difficult. Water bottles are wasteful and expensive. Bring reusable ones and invest in igloo or uline water jugs. A backpack or two for bringing water and snacks and maps on hikes. Definitely hand soap because any campground I’ve been to doesn’t supply any. A pop up canopy to cover your food table. Depending on where you camp you may want to invest in bear boxes and bear pepper spray. Walky talkies can be handy with older kids who want to explore on their own but sometimes the woods has bad cell service. And for that reason also, bring a paper map of the area. And a well stocked first aid kit!! Not a tiny one – like a big one with splints and bandages etc. 1. I second the rope for a clothesline, and clothespins of course. 2. Dishpan, soap and sponge, and a dishtowel. 3. A large Rubbermaid container for your pots and pans and other utensils to keep them clean. Another Rubbermaid to keep your food. 4. Marshmallow roasting sticks and smores supplies! 6. We always hang an American flag! I posted this on another of your camping posts, but I will share it here for others’ benefit: bring a carabiner to “lock” the zippers of your tent together from the inside at night. Raccoons can work zippers and will do so to get to food inside your tent. We woke one night to a paw sticking through the small gap in the zippers; thankfully the carabiner prevented them from getting the zippers open farther! Long ago, we left a backpack out at night (NOT in bear country), and a raccoon unzipped a pocket, removed a granola bar, and zipped the pocket back most of the way. I wouldn’t have believed it if we hadn’t found the trash close to the campsite. Backcountry or in a camper is different but if car camping lock your food in the car. It’s keeps ants out, no snacks crumbs in your bedding, and your crew will have better habits if you are in bear country. We diligently put away our food one night and had a raccoon eat our bait for fishing off the picnic table. Great list! We pack rain boots – those are perfect for chilly rainy days. Citronella candles – we use these instead of lanterns so we can have a little light without attracting bugs at night. One towel per person plus rope for a clothes line – the same towel can be used after swimming & showering. Water filter. That way you don’t have to lug a ton of water, even to more remote sites because even creek, lake, or river water can be filtered. Jet boil, for windy nights. While I wouldn’t recommend this to new campers (camp first to make sure you’ll do it again! ), after camping at the beach with so much wind that we couldn’t even keep a charcoal grill going and had to eat cold chili, we never camp without our jet boil! I’m no camper, but I have been hiking and gotten eaten alive by bugs because I used some fruity shower gel ?? Oh yes! That’s a good tip to not use stuff that smells like flowers! Anything fragrance. : Shampoo, conditioner,deodorant will attract bugs. Try to use unscented or as light a scent as you can find. First camping trip with boyfriend (now the husband of 35 years that I leave home), he put aftershave on after his shower. The bugs loved it. He was bug bait for sure. Plastic table covers from the dollar store. We put these down on the table before every meal to set our food on. Every year that we go we have a menu set up for the whole weekend. One person will purchase the food based off off the budget. One person will pack the food. Another person will transport it. Everyone no matter what age is required to help with one meal. Prep, cook, clean. This is my favorite part of the weekend when we are all working as a team. Don’t forget a bucket so you can fill it with water if you are building a fire. Deck of cards for fun games. Food/Candy with holes (fruit loops, pretzels, cheerios, peach/apple fruit rings, bite size licorice, etc) to put on a necklace (licorice rope if you trust it not to break or yarn) so it’s their own afternoon snack they make themselves and they can carry it with them on a hike. We’ve ditched our air mattress and use self-inflatable camping pads we got at Costco (Lightspeed brand). We have found them to be more comfortable than the air mattress. We also take a shovel for fire suppression and an ax to make kindling. Hiking boots and clothes that can be layered when it gets cold. We try to pack light as possible since many times we are hiking into wilderness areas for a weekend or weeks at a time or traveling in our canoe with our kids and animals (don’t forget their dog food). Don’t forget the camera! Our biggest item is a large pot for sponge baths, boiling drink water, and washing dishes or clothes but I wrap items in towel and place in the pot for transport. We also each take a whistle with a first aid kit inside…the most dangerous bear is when it is surprised or you get between it and it’s cub so whistle or talk loudly will let it know you are in the area. The whistle is also handy if someone becomes lost. A sharp knife is essential. Remember: Pack In Pack Out! Definitely a good length of rope for hanging towels or sleeping bags if they happen to get wet. You never know how far apart trees are so it’s always better to take too much rope than not enough. Bungee cords are also handy to have. You can use them to hang your garbage bags or anchor down your tent or tarps in a wind storm. And duct tape. As much as you use it at home for quick fixes, the same goes for camping. It can be a quick fix for a tarp or a canopy or a ripped garbage bag. None of these items take up much room so it’s better to have them then leave them at home. I’d recommend a little 1st aid kit as well, one you can make and customize. Basics include gloves (I prefer nitrile myself), bactrim or neosporin ointment, hydrocortisone ointment, tweezers, magnifying glass, various size bandaids, burn ointment, gauze, eye wash, fabric tourniquet, alcohol wipes, etc. I’m in nursing so mine is huge. I’d also recommend a solar lantern, I know you mentioned lanterns on your list. I bought solar lanterns a few years ago on Amazon and they’re quite handy. There were under $15 each and last over 12 hours if charged. We take clothesline and clothespins that way we can dry our clothes and also matches in a waterproof container which we bought from the Wisconsin dells waterpark. Keeps money, keys and matches dry. Glow in the dark tape to put on ropes for the tents so you don’t trip over them or the stakes. I get solar light stakes at the dollar store and put them in the ground by the stakes. We used to have an older tent that the kids used for play during the day — this way they weren’t going in and out of the sleeping tent all day – tracking in dirt etc. 2nd tarp – once one is under your tent — its not moving. Make sure the tarp does NOT stick out from under your tent. You’re just creating a funnel for the rain if you do! Do NOT keep food of any kind in your tent! When packing food and coolers – pack according to the meal — not like things. It’s so much easier when finding ingredients. Keeping one cooler for drinks (without milk) makes it so much easier since that one is often opened and closed. We recently did a “power up” theme camp for Cub Scouts where the boys learned about different types of energy. We lit up our camp with the small solar yard lights from the Dollar Tree and WalMart. I don’t think we’ll go camping again without them! It was so nice to have the tent doors and paths marked at night. Great list. I’ve not been camping like this, but my brother has taken my boys. He bought the youngest a hammock to sleep in or lay around in during the day. Some of our camping tips were already listed above so I won’t repeat them. We usually bring a tote with cooking supplies and two coolers – one super-cold one with our meat, dairy, etc. The other is for drinks and fruit. Things that won’t matter if the ice melts so they’re only a little cold. We wash out milk jugs and freeze water in them in the weeks before we go camping. They’re great because 1) we have water to drink 2) it helps keep the coolers cool and 3) when they melt, they don’t make everything in the cooler soggy (We do add extra ice to our meat coolers. I’m very picky about how cold it stays!). Zip-top bags; makes it easier to store leftovers in the cooler. Our last day camping is usually where we try and eat up all the leftovers in a free-for-all meal. Oven mitts for taking hot pans off the fire. Extra blankets; it doesn’t matter if it’s August and 90º at home – it might drop to 40º if you camp in colder areas. You want to be sure you stay warm and dry for good sleeping. Even though my kids are teens, we bring diaper wipes because they are great for really cleaning hands (but not as harsh on skin as disinfecting wipes). Glow sticks are so much fun at night while camping (some people put them around tent stakes so people don’t trip at night). We got an over the fire pop corn popper that everyone loves. My husband got flint fire starters (maybe at REI?) and taught the kids how to start fires using it. Citronella candles to repel bugs are handy. We also bring a bunch of quarters to use to use the showers (as they only accept quarters in our state). Happy camping! Great start to your list, but a lot is missing. I like to bring a rope to hang between a couple of trees. It makes a great clothes line to hang up swimming towels & suites and bathing towels and anything else that gets wet. Put your food in a plastic storage tub (items that don’t need to be refrigerated). That way animals can’t get into it during the day if you leave your site and it’s easy to pick up and put in the back of your car at night. I also keep a smaller storage tub of “kitchen supplies” I went to the local Dollar Tree and stocked up on items like basting brush (for BBQ items), a couple of metal tongs, plastic plates & cups, silverware, spatula, and a big bucket to wash the items in along with a couple of dish towels. It prevents having to constantly stock up on paper products and prevents the waste. Also if you plan on cooking on anything else but the fire, you will need a small Coleman stove & a small tank of gas (the tanks last forever). A good cast iron pan is great to keep in the dish bin as well. We go camping a lot and I always love having things ready to go on a moments notice and not having to worry about getting anything together, but the food. Loved reading your list and all the comments. I said I was done with tent camping about ten years ago, then I got the courage to try it again last year to Yellowstone. It was super cold at night early in August. But we made sure to get electricity at our campsites–so I took a “hotpot” and a small heater and a small fan for white noise. I didn’t trust the heater on unless I was awake or nearly so. The hotpot was the greatest help. Since it was like low 40s in the mornings, I had hot water in a couple minutes to get a hot drink. And easy hot chocolate at night. I always take the clips for picnic tables to anchor the tablecloth. It can be very windy!